A trans-continental bike ride to raise awareness about the abilities of the visually impaired. 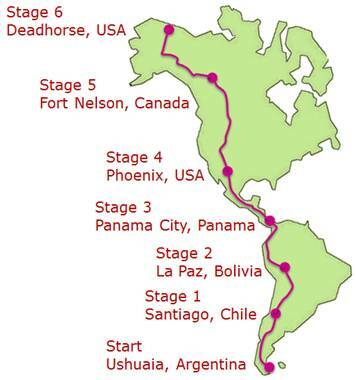 Phase I of the Americas 2012-13 came to a close at the end of June 2011. Activities for Phase II are now in full swing. We are strongly considering heading to Ushuaia in December 2011 instead of January 2012 in order to take advantage of the summer months down there. Besides, the notorious winds of Patagonia will gain more ferocity in the months after. 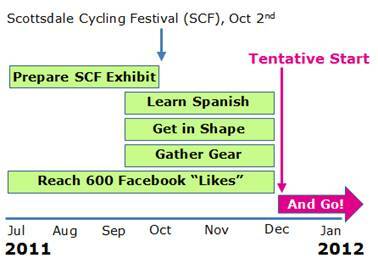 Our goal in sharing these activities is to include you on our long, fun and adventurous journey. We hope you are as excited as we are! Our number one mission for this journey is to raise awareness; therefore, it was imperative that we had an online presence to share our story and to let people join our 16,000-mile bike ride through the Americas. We wanted the flexibility of managing our own website in order to best represent who we are and what we’re trying to do. And since we are on a “do-it-yourself budget,” we learned the basics of HTML and started developing the website. The project started with designing the 2B2R logo. This was an iterative process that truly represented teamwork. We began with a brain-storming session that started with our “Two Blind to Ride” moniker, which was coined back in 2009 when we rode across the country. Somehow, we both had a similar vision for how the logo should look. The words "Two" and "to" would be 2s to represent us on the bike, and the words "Blind" and "Ride" would be depicted with a font that resembles the tandem and the trailer. We made sketches and discussed style and color. Then we moved our efforts to the computer where Christi used Photoscape to create a preliminary logo. Then Tauru took his turn and made modifications to improve it. Then Christi again, then Tauru. An old draft of our 2B2R logo. This back and forth process went on for several days (and countless hours!) until we achieved the logo you see today. Designing the layout of our website involved a similar process. We made a list of all the things we wanted to put up there, and then bucketed them into categories to create the menu. We reviewed other websites and adopted things we liked about them; conversely, we made sure we avoided things we didn’t like. Coding wasn’t that bad - well, okay, it was! It took a lot of perseverance and an eye for detail; but now that the layout is established, managing the website is simple and straight-forward. This was one of our requirements since we would be making updates while on the road. We initially launched the website as a subdomain of our personal website, tauruandchristi.com. We wanted to work through the kinks and layout issues (how files and folders should be labeled and stored in the server, etc.). But as of July 15th, we have transitioned to 2B2R’s final home at twoblindtoride.org. Asked if the fuchsia/chartreuse color combo is “too feminine,” Tauru responds, “What’s so feminine about E1008C and C8FA8C?” Okay, Tauru, time to step away from HTML-ing!! As for an intro video, oh yeah, we had to have one! Although, making it was harder than we had anticipated: the planning, the sequencing, the “acting,” the formatting, the choosing of music and theme, and so on. The process for creating our video took a highly organic form. We recorded snippets of us using a point-and-shoot camera (again, the “DIY-budget”). We thought about writing a script, but that just didn’t feel right. So, we just said what came naturally, which turned out to be 30 minutes of footage! Trimming that down to a couple of minutes took serious work. Nevertheless, the energy of the final product makes us want to go out and ride right away. Ride, ride, ride! This one is exciting! When we started the project, we wanted to find an organization that was heavily involved in eye research. We wanted to raise awareness about blindness, and we wanted to share this initiative with folks whose ambition is to prevent or cure blindness. The people at Research to Prevent Blindness (RPB) became interested in our cause. They focus primarily on funding eye research and so little is known about them outside of the institutions and the scientists they fund. RPB is fortunate in that it has a large endowment that generates money to fund projects (~$13M solely for Research Grants and Other Service Allocations for fiscal year 2010). RPB’s small staff of ten limits its ability to communicate with the general public advances in RPB-funded research. The non-profit organization has been influential in elevating the importance of creating independent ophthalmology departments at medical schools—this allows bigger budgets to fund ophthalmology-related research. RPB was also instrumental in the creation of the National Eye Institute within the National Institute for Health. These two accomplishments alone have enabled eye research to gain more footing at research institutions. For our ride, we want to let people know about RPB and what RPB is doing. Help us share their work! We found a website with a list of schools for the blind around the world. We’ve sent a batch of letters (in Spanish) to the schools in Chile since we’ll be there first. Hopefully the addresses are still valid—the limited info does not include emails or telephone numbers to contact them. When we start in Ushuaia, it may be that we’ll have to find these schools! How ironic; the blind looking for the blind! We’ll ask around and seek the guidance of locals to find those like us! This part of the project has been pretty challenging. We contacted a number of potential sponsors, but only a few responded. Fortunately, the folks at Slime and Click-Stand were really enthusiastic about our project and they have provided their support. Thanks! Also, 1offpowdercoating.com has offered its support. The small powder-coating shop’s owner, Dale, had followed our ride across America back in 2009. When he learned of our intentions to ride the Americas, he wanted to help somehow. So we’ll be getting our bike custom powder-coated in the colors of 2B2R. Thanks, Dale! We’ll continue to ping potential sponsors and keep begging. Who knows, right? Perhaps there are other ways to fund this project? We created the “Support Us” page in response to the feedback we received from various folks. It’s a good cause; but more importantly (as people have noted), it’s an awesome journey! For those who support us, we’ll ride like the wind and keep you in our thoughts. Raising awareness is key. We say to those who want to support us: first and foremost, spread the word and tell others about this journey and its purpose. Let others know that people with visual impairments can still do cool things. For those who want to do more, we encourage you to donate to Research to Prevent Blindness (RPB). For 2010, almost 90% of RPB’s budget went into funding research grants and research related programs. Your money directly impacts research rather than administrative expenses. Okay, if you still want to do more, we do have the option to contribute to the funding of this trip. The 18-month journey is going to cost money; therefore, we would absolutely appreciate any assistance you can provide. But wait, there’s more! As you can see on the “Support Us” page, there are benefits for your donation. But wait, there’s even more! We’re planning to document the ride and would love to share this with you. We’ll send you a book, or a video, or both. A video? Yes, we want to make a documentary-style film about people’s perception of blindness along our route. How does the general public in both continents view people with visual disabilities? We want to tell you by the end of 2013! Contributions so far are much appreciated! Thank you so much! We’ll be riding with you in mind. Supportive people are the foundation of a good society. It always comes down to money! How much does an 18-month long journey across two continents cost anyway? We developed three cost options (for two people) based on various levels of “roughing it”: (1) Luxury at ~$38k, (2) Moderate at ~$25k, and (3) Economy at ~$17k. Gear: There are things we need like a pull-along trailer, video camera, bike equipment, etc. The three options will determine which whether we’ll get them all or only the basics. Fly to: This is a high-cost factor. And we’re not even considering flying back to Phoenix from Deadhorse, AK because it’s about two or three times the cost from Fairbanks, AK. Once we get to Deadhorse, we’ll just ride back down the 500 miles or so to Fairbanks to fly home. Flying straight to Ushuaia is out of the question! Punta Arenas is more reasonable; we’d have to ride ~200 miles down to Ushuaia to start, which means riding back up again. Buenos Aires may be the way to go since there may be either reasonably cheap flights or long-haul (24-hr) buses down to Ushuaia. Hotels: We’ll be roadside camping most of the time; but it would be nice to check into a hotel once in a while for a warm shower and a soft bed. Food: Fuel for the legs to pedal 16,000 miles. We estimate that we could get by with a budget of less than $700 per month for the two of us (Economy option). This is based on our experience traveling abroad on a shoe-string budget. This is for everything, including food, lodging, etc. We plan to keep things to a minimum in order to make it happen. Darian Gap: Ah, the Darian Gap, where no road connects Panama and Colombia. The dense jungle or the drug cartels have eluded this feat. So how will we cross the Darian Gap? Most likely hitch a ride on a passing boat or something. Budget constraints are sometimes a blessing—they encourage adventures! 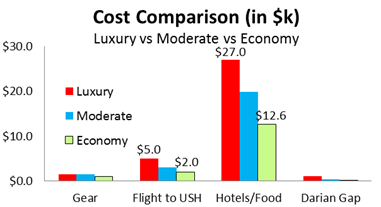 The “Economy” option for Hotels/Food will minimize cost ($700/mo x 18 mos = $12.6k). Ultimately, raising awareness is our primary goal (psst, psst: the ride itself is absolutely irresistible!). We want to change people’s perception of the visually impaired. 2B2R accomplished just that (June 21st Update, “No Regrets”) when a neighbor, 59, had a change of heart and understood what we were trying to do. At first, he was adamantly against it, convinced that we couldn’t or shouldn’t do such a thing. He envied the trip’s breadth of adventure, and even more so because (until his change of heart) we shouldn’t even be able to do it. He didn’t know us at first, but now he does, and now he sees people like us differently. ü Come visit us at our exhibit! ü We are currently at 330. If every “fan” recruits just one friend, we will be there! · As we’ve noted above, we may start a month earlier than planned. We’ll keep you posted. Special Thanks to Benning Tieke of Flagstaff, Arizona for providing Spanish translations for our Media Brochure and letters to schools for the blind in South America. Muchas gracias, Señor!